Having heard a lot about Matt Haig and listened to a podcast on which he featured, I was intrigued to read his new book. Matt has written fiction for both adults and children and he also wrote a book called ‘Reasons to stay alive’ after he suffered with severe depression and anxiety. 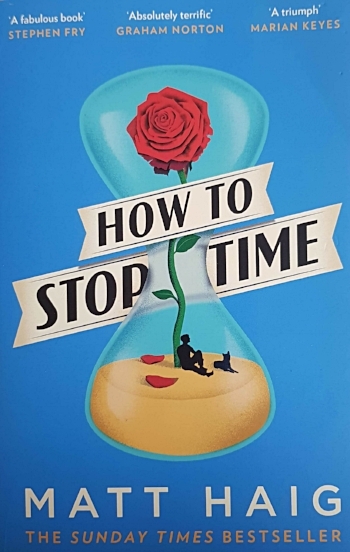 How to stop Time has a wonderful premise. It is told in the first person by Tom Hazard, a man who today is in his forties however he lives with a rare condition that means every 15 years he only ages about 1 and has been alive since the 1600s. He teaches history in a secondary school, the children unaware that he has lived through the lessons he is talking to them about. All is not as it seems however and the reader is taken through different times and across different countries to learn about Tom’s whole life, how he has got to where he is, and others with this rare condition. This book is very easy to read and drew me in pretty quickly as I was intrigued by the original storyline and concept. Well written, interesting and just the right level of description, this book can be enjoyed by all ages from mid-teens. I’d give this book an easy-going 3/5. A good holiday read if you want to escape and not think too much. Have you read this book? Would you recommend any other Matt Haig novels? Leave a comment below and let me know which one to read next!